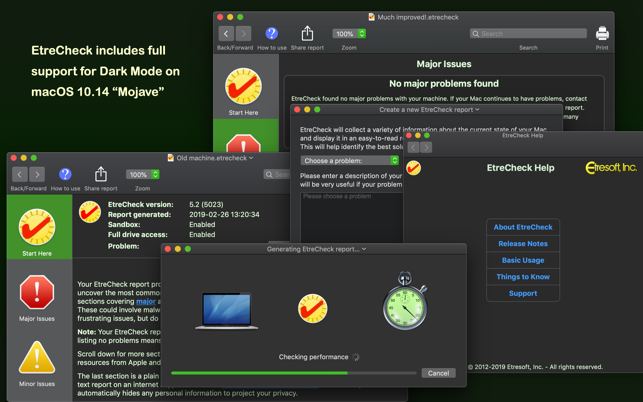 The software gives you a good general report for free. You even get security information identifying potential issues for free. The free info is useful if you understand something about computers or know others who can help you, such as those at online forums. The people not understanding this downgrade the software because they want something for nothing. Sure, we all want something for nothing. But how many of us work for free at our primary jobs? Should Etresoft developers work for free? Working for free at your primary job is slavery. Go visit the Amish country of Holmes County Ohio, for example. The Amish use horses to pull their plows. The Amish feed, water, groom and shoe their horses. Think of Etresoft developers a plow horses checking out your Mac. :) Pay the cost if you need the more detailed info. Otherwise, use the free information and be grateful. 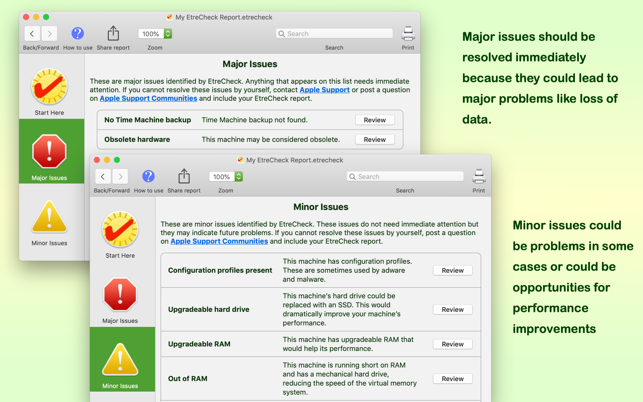 I have a 2011 mac that was starting to have some major issues and Etrecheck confirmed that the HD was failing. Fortunately I had all my Time Machine backups on an external and after installing a new SSD drive and restoring my Mac is almost like new again. 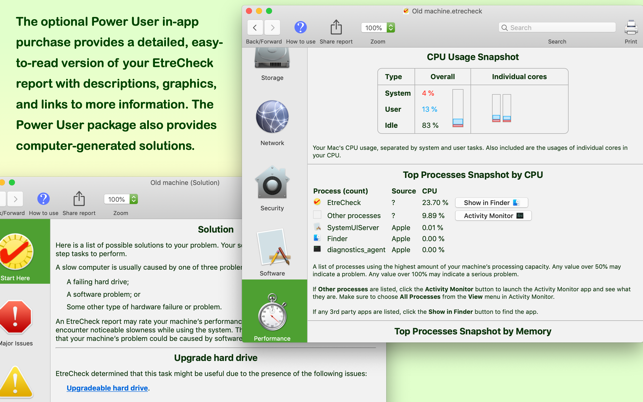 This app gives good information for anyone with just a basic knowledge of computers and this combined with some google sleuthing helped save me from having to buy a whole new computer. Thank you to the developers for a great app! Other reviews indicate that this App gives useful information but from my experience I was not given anything useful unless I would pay $9.99. Being the App did not give me anything useful without paying up, I did not go forward and check out what information the system checkup had to offer. I don't expect anything for free, but I just want to know that the information that I will pay for is useful and this was not apparent from what I am told by the app. I need just at least a bit of indication I can trust moving forward. 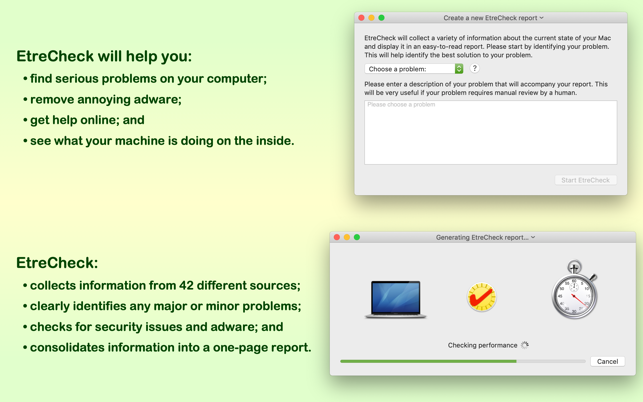 Many thousands of people have used EtreCheck - for free - to solve problems with their computers. If the information isn't useful to you, it might be useful to someone else. There are a number of popular internet technical support forums where people will help you solve those problems. 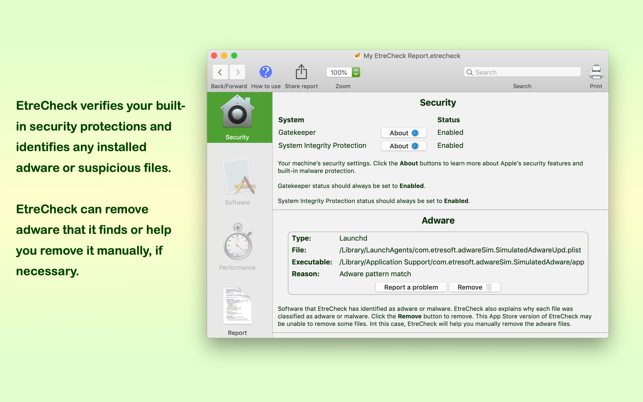 They will usually ask for an EtreCheck report, which you can provide - for free. 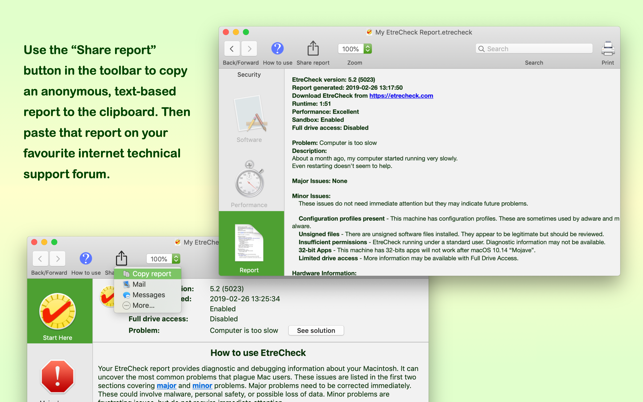 If you don't want to post your report publicly, then EtreCheck does offer an enhanced, easier-to-read interface and computer-generated solutions as in-app purchases. Yeah, you have to pay for those. That's the way business works. I realize that everyone would prefer to get all functionality for free, but then we couldn't develop the app at all and no one would get any functionality whatsoever. Catch-22, eh?